Ah, the French. I wish the rest of the world wouldn’t reduce them to a meaningless stereotype of good wine, cheese, and love makers. After all, there is another thing the French are becoming better at making: the cellular phone. 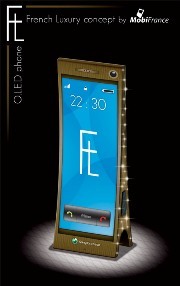 MobiFrance has recently partnered up with Sony Ericsson to develop a concept cell called the French Luxury (FL). The FL is designed to commemorate France’s Independence Day by bearing a strong resemblance to the Eiffel Tower, the most recognizable French landmark. The phone can stand on its end to resemble the Eiffel Tower, and is equipped with a full touchscreen. Unlike other touchscreen phones, the FL’s touchscreen has a somewhat curvaceous look to it. Other features that we know about are the speakers on its sides, which you can see on this photo. You can also watch video and other multimedia functions. Another feature is the obligatory camera, which is a lot better than other cell phone cameras at 7.2 Megapixels. So far, there is no word on a price or availability date for the FL. Considering that the French Independence Day is July 14, I’m guessing that a year is plenty of time to get it out for the 220th anniversary. Mobile manufacturers are being “extra” creative lately. I wonder what’s the actual size and weight of this phone. If France has Eiffel Tower, I guess it means another mobile maker will come up with a handy phone designed after Statue of Liberty for our dear USA(? ).